When you visit lower level regions in Guild Wars 2, your level gets adjusted to the level of the area but what else is affected by this downscaling? I might be wrong since i didn't test it, but it seems to me that i do quite a lot more damage in areas scaled to level 5 than when i actually was level 5, so it seems some properties don't get fully adjusted. How does downscaling affect inherent stats, item stats (damage, defense & bonus) and other effects? Level downscaling will downlevel your character to the maximum allowable content level for that area. So this will affect all your primary stats, Toughness, Vitality, Power and Precision. When you open your hero panel you'll see your main stats on the right in white, and next to them on the left you'll see your 'effective' stats in green. These are the numbers that you're going to be using. As these numbers are changed this will effect your damage, hp, crit chance, etc. The thing with you feeling more powerful is that you still have the higher level gear. So for example, if you are lv30 you might have an amulet with +11 power. You go to a lv10 area, and fight with players who at lv10 can't even equip an amulet. Now I'm assuming, but let's say that the downscaling is a %, then your overall stats will be higher, meaning you'll be stronger at lower level because of your better gear. You are by no means at all invincible, but you'll certainly fare a little better due to having more or better gear. The real killer is that as a higher level you will have traits and skills available which lower levels will not. You can also use your Elite skill still, if you've unlocked it. So there are some advantages to revisiting the lower level areas. I think most people's experiences of this will be doing each of the race's starter areas once they've finished their own. Character level adjustments have a limit, however. The level-adjustment system won’t let a level 1 character go head-to-head against a level 80 character with much chance of victory—a level 80 character is still going to have more bonuses on their gear and access to a full complement of utility and elite skills that players just don’t have at lower levels. This is not to say that the high-level character will one-shot the level 1 player, but they will have a clear advantage. 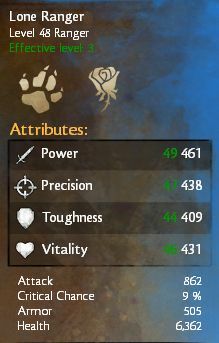 How does equipment scale regarding sidekicking and WvW? What is the Guild Wars 2 map overflow, and how does it work? How does the day/night cycle work? How does “3x damage” work? How does the 'Keen Edge' ability work? Are there any preferable stats for World vs World combat? How does the Rangers Spirit effect recharge time work? How does the new trait system work?